Mr. Brian Wilson started the Jukido Jujitsu journey in early 2009 as a member of the Jukido Academy under the instruction of Sensei George Rego. From the beginning Mr. Wilson swiftly absorbed not only the techniques but the attitude that embodies the Jukido way. He is a committed member with tenacity that is second to none. His jujitsu studies include regular weekly classes, full participation in special training sessions, regional and national seminars with the world’s leading Jukido Jujitsu instructors, and advanced black belt training. Aside from this, he frequently has private one-on-one training sessions with his sensei. In addition to his primary training in jujitsu, he is also a formal student of Kokondo karate with the kyu (below black belt) rank of red belt. Anyone walking into the Jukido Academy today would be immediately struck by the transformation that takes place with Mr. Wilson once training officially begins. Widely known for his cheerful manner and good natured attitude; once training begins – Mr. Wilson becomes one of the most intense work horses in the history of the dojo. A beginner would see a physically fit “drill sergeant” with a black belt and assume that things came easily for him. They couldn’t be more wrong! The transformation of fun-loving individual to warrior isn’t the only transformation that Mr. Wilson has undergone. When he began Jukido Jujitsu he was in excess of 250lbs and heading toward a life with the complications brought on by lack of exercise and excessive weight. Today, through discipline and Jukido Jujitsu, he is 75lbs lighter and in prime physical condition. Jukido Jujitsu was a major contributor to not only transforming him into a warrior but to setting Mr. Wilson onto a new path of health and happiness. He is an inspiring example to many of what is possible when they stop making excuses and start finding the reasons to push themselves beyond what they thought was possible. 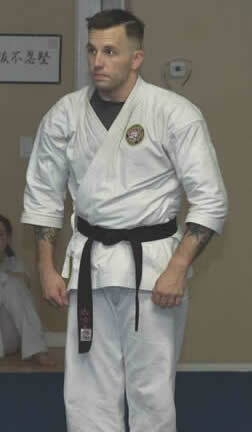 As a black belt – 75lbs lighter and as a prime example of what can be done with and through the Jukido way. Along with fellow black belt and friend, Mr. Hugo Camacho, underwent the extensive black belt testing experience that is now a well-known trademark at the Jukido Academy. This grueling process forces the candidate to dig deep into their abilities as a martial artist, their physical conditioning, and find the heart of a fighter. The black belt rank evaluation process took place over several months with six separate examinations. The extensive hour-plus long evaluations each covered various areas of expertise (self-defense, throwing, disarming, kata, sparring-randori, etc.) ensuring that he, as a potential black belt, had a comprehensive skillset and through understanding of self defense. His final rank evaluation took place at the IKA 2013 National Seminar under a testing board made up of the art’s most senior sensei and masters. After a confident display of technique and spirit he was elevated to the esteemed black belt (shodan) in Jukido Jujitsu. Mr. Wilson is known around the dojo for putting his money where his mouth is. He demands the best effort at all times from his training partners, students under his instruction, and most of all himself. He plays hard and works even harder. He is humble in taking instruction but always on the frontlines of a hard training session – serving as an example for all. His favorite aspects of training include jujitsu and karate kata, randori, and high pressure & special situations self-defense (disarming, hostage scenarios, active shooter etc.). He continues his journey toward black belt in Kokondo karate and advanced black belt rank in Jukido Jujitsu. Over the years Mr. Wilson and his sensei have developed a unique friendship and special bond that includes their love of martial arts but extends beyond it as well. 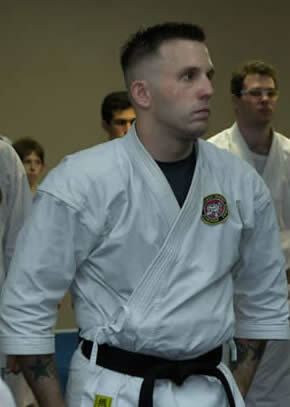 Outside of his study of martial arts, Brian Wilson is a solider with the United States Army National Guard. His deep love and appreciation for service, country, and martial arts is second only to his love of family. He is a devoted husband to Crissy and proud father of a two amazing children.